After enclosing this glove, the cover interferes some connections in the circuit. It delays sounds a bit. Here is a video which documents making sounds by tapping fingers. For the future, MACHINE WILL ADAPT TO HUMAN, INSTEAD HUMAN ADAPTING TO MACHINE. Although we try to make our products more user centric and easy to use, users still have to learn how to use them. Can products learn users' behaviors by technology, so as to allow users to use these products intuitively? 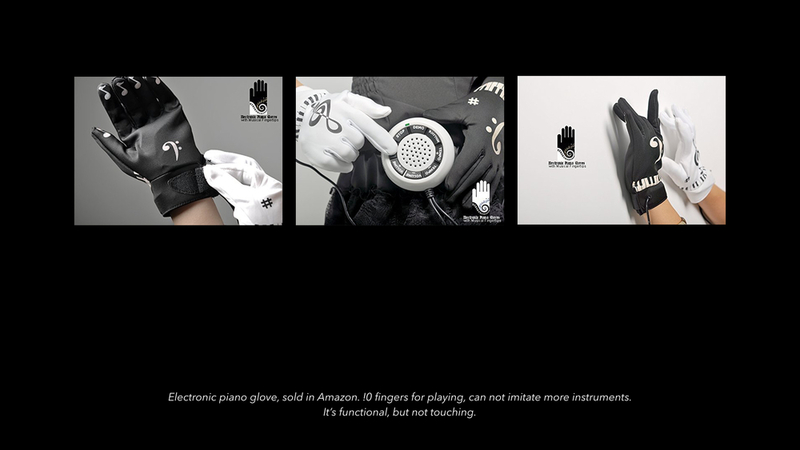 For exploring this design philosophy, I created a MIDI glove combining my hobbit. How to make an instrument that can adapt to humans' natural behaviors for playing sounds. Making different sounds by tapping different fingers is a intuitive way for playing sounds. Besides, fingers are agile enough for creating complicated music. Keyboard instruments is adapting to that behavior. However, can I design an even easier way? When tapping on keyboard, we need to remember the locations of different sounds. For that, we have to practice for a while before playing intuitively on keyboards. How to skip that part? How to play without remembering different locations? I also got some inspirations from tap dance that tapping on any where for creating beats. My solution is designing different sounds on our fingertips, so we don't need to find them on keyboards anymore. There is only one glove for the left hand, only 5 fingers. But as tapping on another color surface, it can give another 5 pitches. When considering technology, sometimes it reminds us pollution, poison, metal box, cold blood... I wanted to choose some material which could let users forget negative images. Finally natural material came out from my mind. 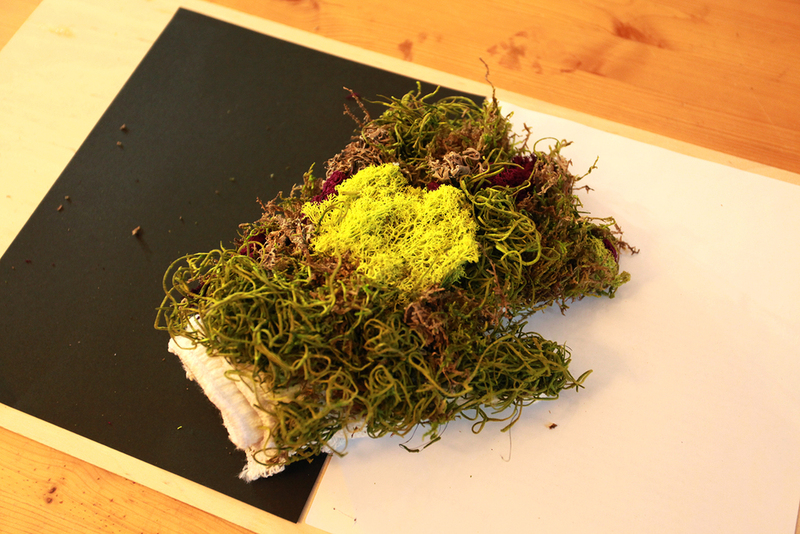 Moss is something standing for life and great natural environment. I wanted to disappear users' worries by using this material. WHY NAME IT AS "MUSIC GARDEN"? I wish I can find a garden or some place with nature, just sitting their, playing some chill music, wasting my time without feeling guilty.